In 2010, UConn created its Climate Action Plan (CAP) aimed at reducing the carbon footprint of the University. The goal of this plan is to be carbon neutral by 2050, with an interim milestone of reducing greenhouse gas (GHG) emissions by 20% from the 2007 baseline by 2020. The OEP has worked with a number of UConn departments to achieve this goal through projects such as re-lamping with LEDs, other energy efficiency measures in existing facilities, and a strict LEED Gold-certified green building policy for new construction. By 2016, emissions had been reduced by 20,381 tons, a 13.36% reduction from the 2007 baseline of 152,538 tons. We recently received 2017 GHG emissions data, and, as of last year, UConn had slipped somewhat, showing emissions reductions totaling 18,822 tons, or only a 12.34% reduction since 2007. This increase in emissions over 2016 is mainly attributable to the energy demand from the operation of three new buildings that came on-line late in 2016 or in 2017: Next Generation Connecticut (Werth) Residence Hall, the new Engineering and Science Building, and the Innovative Partnership Building. 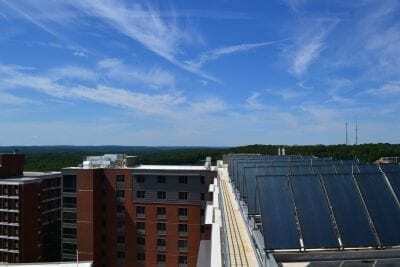 Despite the added GHG emissions from powering, heating and cooling these new buildings, UConn still made critical progress by further decreasing GHG emissions through ongoing projects like retro commissioning and re-lamping. While UConn did emit more GHGs this year than last, the University is still on track to meet its 20% emissions reduction goal by 2020. When ongoing and proposed energy efficiency and clean energy projects are accounted for, UConn is on track to reduce emissions by 32,614 tons by 2020. This would be a 21.38% reduction, exceeding the 20% reduction goal. One possible development that could influence this projection is the number of curtailment days the university utilizes. During especially cold winter days on campus, when the demand for natural gas is high, UConn burns oil (a more carbon-intensive fossil fuel) instead of natural gas. For future projections, 20 curtailment days are accounted for, with each curtailment day adding 210 tons of emissions to the total. Under our three year gas procurement contract with CNG, however, it is possible for the University to have up to 30 curtailment days in a year. 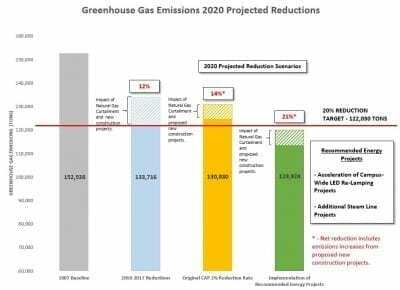 When the additional ten curtailment days are accounted for, the projected percent reduction drops from 21.38% to just 20%, right at the goal, leaving less room for unanticipated emissions increases. To help offset the impact of curtailment days, UConn continues to focus on its ongoing emissions reduction initiatives, like re-lamping and steam line replacement projects. 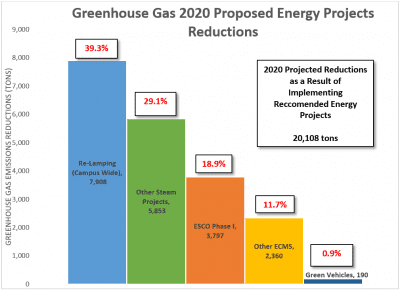 OEP and Energy Management staff estimate that campus-wide LED retrofitting of all interior and exterior lighting will contribute nearly 40% of emission reductions needed by 2020, with steam projects contributing another 30%. Given the momentum from these ambitious projects, we are optimistic that UConn will achieve its 2020 reduction goal!